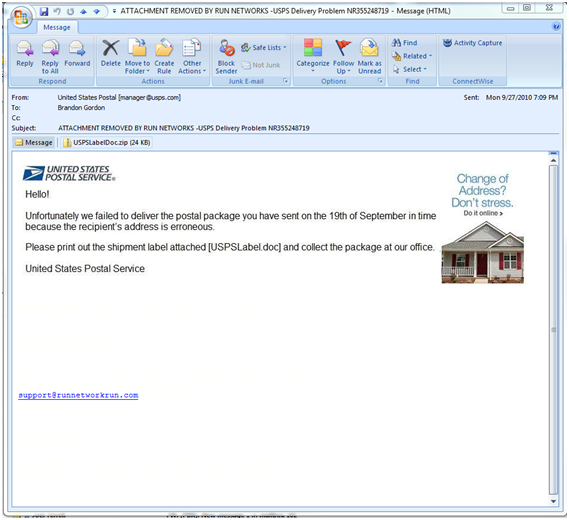 Below are some screenshots from an email I received containing malware in an attachment. This message looks like it's from the United States Postal Service, and that I missed a package they tried to deliver. It contains an image of the text that overlays any other text in the email so the user can't see it. The zip file contains a single file, USPSLabelN86767701.exe that would look like an Excel spreadsheet if I didn't see the exe extension. That file is definitely malware of some sort, but unfortunately wasn't detected by AVG even with the newest definitions. Our spam filter holds all email containing zip file for this reason.